The Weekend in HD - Thursday 18th April | What Hi-Fi? Hello, and welcome to a special edition of our usual Week in HD blog - The Weekend in HD! 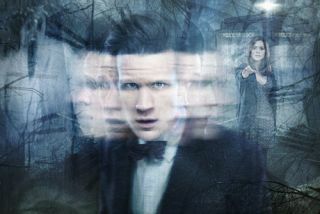 We had to flag-up some of the exciting HD shows on this weekend - most importantly, the London Marathon and a spooky haunted-house episode of Doctor Who. And remember, you can get daily updates on what's on by following us on Twitter @TodayinHD. The remaining six chefs team up to cook lunch for over 200 firefighters at Fire Service College in Gloucestershire. Back in the MasterChef kitchen, the team must cook 20 breakfasts within an hour to fight for a place in the final. May and his Man Lab team go in search of a wedding ring lost in the 1970s, and launch their very own pirate radio station. Warwick Davies is our guest judge tonight, with Gyles Brandreth and Joe Wilkinson joining regulars Ian Hislop and Paul Merton on the panel. Therapy. Lee's father makes a reapparance, attempting to heal their troubled relationship with Lucy's intervention. Again. Probable Cause. There's been a murder, and Castle is the main suspect! As he goes on the run to find out who framed him, Beckett wonders how well she actually knows Castle in light of their new relationship. There's a new sci-fi show in town. The premise might sound familiar - aliens and humans attempting to coexist peacefully after a long and bloody war - but the character designs, especially those of the pale Votan aliens, and a cast that includes Julie Benz, Jaime Murray, Tony Curran, Stephanie Leonidas and Grant Bowler, is sure to attract interest. Hide. A Doctor Who ghost story! We're properly excited about this one - writer Neil Cross takes us to a haunted house in 1970s Britain, and the preview trailer was full of mists and ghosts and dark corridors and spooky camerawork. We've been promised a cheeky Scooby Doo-style scene, and some new and interesting facts that deepen the mystery surrounding Clara. Why does the TARDIS seem to dislike our new companion…? Confined to a hospital bed and dogged by paranoia, crime novellist Robert Downey Jr escapes into a dream fantasy where he's the hero of his own pulp fiction, and sings his way through mobsters and molls. Also stars Robin Wright Penn, Jeremy Northam, Katie Holmes, Adrian Brody and Mel Gibson. Settle in for five hours of running, as the 33rd annual London Marathon kicks off. Over 36,000 participants, including Olympian Mo Farah, will be tackling the 42km course around the River Thames. Let's hope the weather holds up. Walk of Punishment. There are so many different storylines happening in this episode that we can barely keep up. As the Night's Watch retreat, there's tension brewing between Dany and her two guardians, and Jaime Lannister could have a hard time living up to his Kingslayer name after this episode's events. The Collaborators. A chance to catch up with the latest from the offices of SCDP, where Don works his magic against a client, while Peggy takes a hard line in dealing with her new staff. Leading man Jon Hamm directs this episode.